Our basic custom made moccasin is made out of standard bullhide with straight trim, straight tabs and a straight heel. We use British half or one penny buttons and our Conveyor belt polyurethane sole and is available in any height or color. Our virtual showroom is divided into two areas. Finished and Natural. Click on the buttons below to enter. *Pricing fluctuates with supply cost, for current pricing please email us with your request. 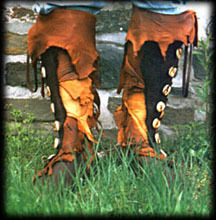 Finished moccasins refers to shoes with design elements like welting, bead-work and layering of various trims and tabs. These styles are more "polished" looking than our Natural moccasins. Natural Moccasins utilize a rougher, more ragged-edged leather for the tabs and layering on the uppers, creating a more "natural", woodsy or Road Warrior look.